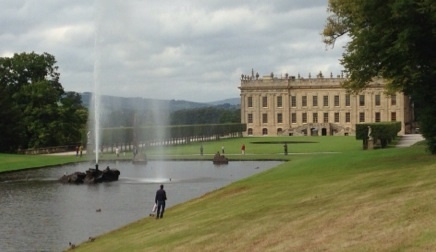 A few days ago, we toured Chatsworth in the Peaks District of England with its acres of rooms and baubles. (What an enormous pile!) We were humming along just fine when, about mid-way through our tour, all that tea and water I’d consumed for breakfast began desperately looking for an escape route. See what a wise man I married? With a kind nod of understanding, she sent me ahead of the group, down the hall, to the right, to a waiting guide who’d been alerted via walkie-talkie. This angel of mercy led me down more halls until we arrived in one of those eight-foot thick passageways trimmed with lovely wood paneling. Discreetly opening one of those “panels,” my angel of mercy exposed a very small, nondescript door, and behind it was – ta-da – a secret toilet! YES! Now, if I’d just thought about this for one minute, I would’ve realized that, of course, there are public toilets inside Chatsworth. * We were touring with hundreds – HUNDREDS – of other tourists. I’m telling you, this place is huge. Of all those hundreds, ALL of them will be able to go through a three-hour tour (yes, three) with no toilet break? Of course not. Not wanting the paying public to piddle on their posh carpets, they do, indeed, have public toilets. They just happen to be hidden toilets – and you have to ask specifically for them. 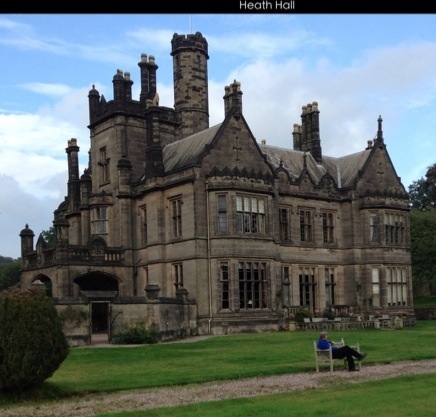 “Heath House is closed for the season.” That’s what the website said. Nevertheless, just a few days ago my husband and I received a private tour by the new owner who inherited the family pile about two years ago. What richness in his touring narrative! “Closed for the season” turns out to be a rather nebulous statement. Maybe it’s closed. Maybe it isn’t. I’d emailed back in August – before leaving the States – and asked if there might be a group tour during our holiday dates that we could join. The OWNER and I then exchanged emails in which he regretted there were no group tours we could join, but would a private, informal tour by him “suit”? I asked, and he said “yes.” See how this works? Bingo. Bango. 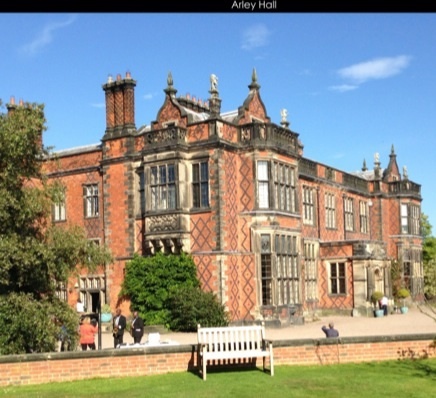 An hour later, we were being guided through Arley Hall by a very knowledgeable guide who’d grown up in the area, went to school in the Arley Estate school, and had plenty of personal-touch information to share with us. On a day when “no house tours are being given,” we had a private tour. Okay, so we’re brassy Americans. a pay-attention tidbit here, too. Of course, we don’t always receive a “yes” just because we ask. Sometimes, we receive a “no.” But this much I know: if we don’t ask, we almost certainly will NOT receive. Pay attention to all the rules, as we did. Acknowledge the “no ______,” then go ahead and ask anyway. Just be really, really, really nice when you do it. *This business of finding public restrooms can be tricky while you’re touring a foreign country. Check out my post The Loo on my blog, CheapTouring, to garner some more tips on this very necessary bit of living – regardless of where you happen to be. Today, my husband and I toured Chester – that most Roman of English cities – which has capitalized capitally on its Roman heritage. Every place we chose to visit regaled us with either video documentaries or information boards about the Roman soldiers, ampitheatre, coinage, amphora, jewelry, wax tablets, oil lamps. All those objects of daily life whose Latin names you taught us and all those details of Roman life “on the frontier” that you made seem so real were real today. And as I heard and read it all, Mrs. Franklin, you were right there with me. No wondering what it was all about for me. No siree. No unfamiliar terms or puzzlements. Much of the information you poured into my head was still there. Much of what I read and heard was just a review of Latin I and Latin II. where do you think I’m heading with this? That’s right: it’s pay-attention time again. When anyone who knows gobs and gobs more than you do about a subject – oh, say a teacher, perhaps – tries to pass along that information, listen up. You never know when that information just might come in rather handy. It might take 50 years – or you might need it tomorrow. Culture is a marvelous thing – passed on from one generation to the next. Millions and millions of times, this is done daily all over the world – and it makes us all richer. No. Wait. That isn’t quite true. It makes only the ones who are paying attention richer. Mrs. Franklin taught Latin and English. She was the woman who firmly fixed in me a love of words and writing. All those times I traveled 1100 miles to visit family in my hometown, I never paid attention to that little voice saying, Visit Mrs. Franklin. Tell her what an impact she made on your life. No, I just ignored it for years until one year when I finally made the effort. When a small voice tells you to take the time and make the effort to say thank you, pay attention. DO IT – before it’s too late. Saying “thank you” the way I’m doing it now stinks.